Exhausted and barely able to stand, Sen. Lindsey Graham can only listen in terror as the yelping from President Trump’s hounds grows louder and louder. 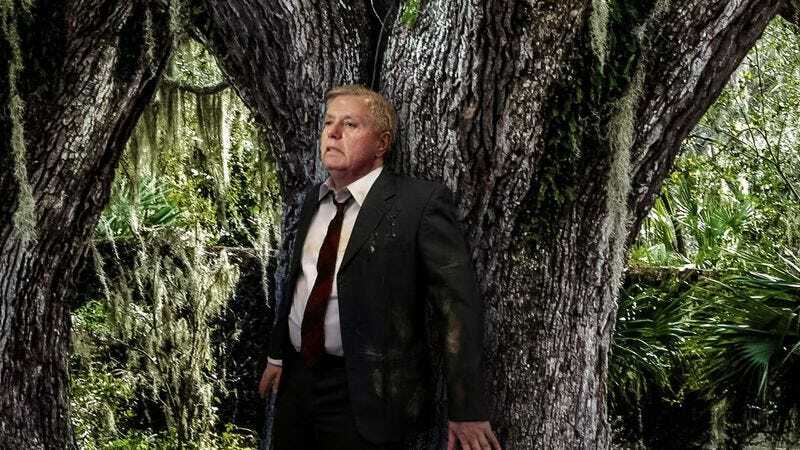 GREENVILLE, SC—After 36 hours on the run through the woodlands of South Carolina, a bloodied and exhausted Senator Lindsey Graham (R-SC) reportedly cowered behind the trunk of a willow tree Wednesday as President Donald Trump’s vicious hunting dogs closed in on him. According to sources, Graham has spent the past day and night wading across frigid creeks, slogging into fetid swampland, and crashing through thickets of thorny brambles in an effort to evade Trump’s pack of hounds, but he has not been able to shake the president’s determined hunting party. “If I can just make it to Virginia, [former Rep.] Scott [Rigell] will help me—he has to,” added Graham, apparently unaware the same dogs had ripped the recently retired Republican congressman to pieces a few days prior in reprisal for calling Trump a “con man” during the presidential campaign. Local sources said the chase began early yesterday after Graham was tipped off that Trump was approaching his Greenville congressional offices with a retinue of valets, who were seen struggling to control two dozen baying foxhounds as they strained at their leads in a frenzied bloodlust. After bolting for the nearby woods, Graham was said to have evaded Trump’s dogs for several hours by slicing open his own hand with a sharp rock, smearing his blood on a tree, and scrambling up an embankment in the opposite direction to throw the animals off his trail. However, reports suggest the hounds were able to pick up Graham’s scent again after discovering a torn piece of the senator’s suit pants on a shrub into which he fell after tripping over a tree root and badly twisting his ankle. Now hobbled, Graham is believed to have spent several freezing hours sleeping fitfully under a rocky overhang, only to be awakened by the sound of the dogs’ sudden approach. Sources confirmed the senator has not been able to escape the range of Trump’s retinue since that time, and has begun to see flashes of the commander-in-chief’s red field jacket between the trees as the sound of his hunting horn comes ever closer. At press time, Trump’s dogs were reportedly charging toward Graham, who, standing at the crest of a waterfall and seeing no better option, leapt into the deadly rapids hundreds of feet below.